Garry Stauber is riding across California! 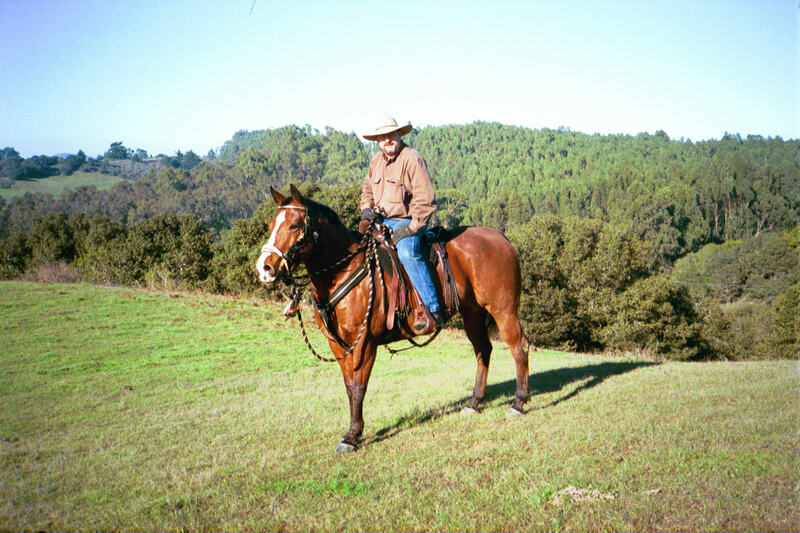 Garry has dreamed for years about riding across California, and now he is following his dream with his two mares, Guenevere and Ginger, whom he refers to with great affection as his "girls". "In his book Treading Lightly with Pack Animals, Dan Aadland mentioned Thoreau's dictate, that we must simplify life in order to know it better. He says, "Some of us have answered Thoreau's call strenuously, even passionately ... so we have periodically fled the concrete for a carpet of pine needles, ... we have rejected the snowmobile in favor of snowshoes." In my case it would mean a giving up a great job, the comforts of a 110 acre ranch with a great king-size bed, and a good pick-up truck for a couple of horses, a sleeping bag, and a tent. Am I really ready for that? He also mentioned "packing with animals is about rediscovery." I certainly was in the mood for "rediscovery." Recently a friend gave me a card with a quote from Oliver Wendell Holmes, "I find that the great thing in this world is not so much where we stand, as in what direction we are moving." I realize he was not referring to geography alone, but the path of growth in our lives." For logistical reasons, Garry is making his journey in two stages, and planned to ride for about two hundred miles before transporting his horses to the Mexican border, where he will turn and head back north - in the saddle.
" Lisa Wood (Long Rider) trailered the girls and me to Mexico. She shuttled my gear for me for the next 3days, to make my trip easier. I stayed at Castle Rock Ranch (100 yards from the Mexican border). Border security was very tight and trucks whizzed by my tent all night. For the next three days I kept seeing ponchos made of yarn lying along the trail. These ponchos are very common in Mexico. I also saw threads of yarn stuck to bushes all along the way, although I never saw signs of illegal immigrants." Garry has now ridden about 250 miles. He telephoned The Long Riders' Guild two days ago to let us know that he had been halted by snow! Yes, snow in California in April - but he was in the mountains of Riverside County. He will wait a few days before continuing. Garry wrote to The Long Riders' Guild to give us an update. "I had been advised by a fellow packer in Anza that the San Jacintos would probably not be passable, due to fallen trees and snow on the shady side of the mountain. But I had also talked with the staff at the local Forestry Service and the Fire Department, and both stated that the trails were clear of trees and snow, but might have some ice. Based on their information, I decided to forge ahead. I chose an alternate route in order to avoid Saddle Junction, the highest part of San Jacinto Mountain. But I was still to reach an elevation of 9,000 feet. The actual traverse up the mountain seemed to prove that the mountain would be passable, as there was little snow. At the 7,000 foot level I had reached snow, but it was only in patches. Then the ridges began to reveal more and more snow, especially on the shade side of each ridge. Very quickly it turned bad. Almost instantly, the girls were sinking up to their bellies in snow and stumbling to move forward. The trail became harder to find. It soon became so bad I couldn't find the trail. The girls were cutting their legs on rocks, as they sunk in the deep snow. The trail was difficult without snow, but now it was impassable. The girls began to stop wanting to go forward. I tried leading them, to no avail. Eventually, it was time to stop and camp, as it was now late afternoon. The clouds looked ominous and they were packing another storm, which meant more snow would arrive soon. I decided to call some experts on my cell phone, to give my exact location, in case of further troubles. My son (Nathan), who is in law enforcement, contacted some peers in San Bernadino, who then called other peers (the Cavalry), to assist me off the mountain the next day. It probably wasn't necessary, but I was thankful to have help leading the girls off the mountain. We decided to leave some gear behind, to lighten their load, so they could walk more easily on the snow-pack. It was great to get down off that mountain." The Long Riders' Guild has received a very satisfactory message from Garry! Well I am finally done. I arrived home Sunday night. 1350 miles total in three months one week. California is a long state. I'm thinking of moving to Rhode Island. I hope you are all in good health and having happy trails." Congratulations, Garry! You are now a Full Member of The Long Riders' Guild - and eligible to apply for Fellowship of The Royal Geographical Society in London. Happy travels, Garry - go well and have a safe journey with your girls.